The reduction of the National Assembly would be to almost precisely its optimum under the cube-root law (population about 67 million, the cube root of which is 406). Obviously, 15% of seats by PR is very minimal (especially if they are non-compensatory). The FT article is short on detail. If anyone is following the French press coverage on this, please share anything else you might have seen that would flesh out these plans. Today is the fourth round of the French 2017 election process–that is, the runoffs of the honeymoon assembly election. Following round 1 (the first round of the presidential election), I used a formula (from Shugart and Taagepera, 2017, Votes from Seats) to “predict” what the round 3 (first round, assembly election) vote percentage would be for the party of first-round leader Emmanuel Macron (on the safe assumption he would win the second round). I pegged it at 29%, based only on Macron’s first-round vote and the elapsed time between then and the scheduled date of the assembly first round. In the actual voting, La Republique En Marche! (LREM) got around 32%, although I believe that also includes some small vote share for MoDem (which was part of a pre-election coalition). In any case, I won’t quibble about an error of ±3 percentage points. At the time, various commentators were fretting over how “weak” EM would be, what with an untested party and Macon’s having come from seemingly nowhere. Some folks even were wringing their hands over possible cohabitation. It did not take long for polls to catch up with the institutional reality, which is that honeymoon elections matter. The voting result was highly predictable. Where I went well off the rails was in questioning whether a plurality of votes of around 30% in the first round could translate into an assembly majority. I noted that similar percentages of the vote in previous first rounds in France had translated into around half the seats, but that a safer prediction might be for Macron’s party to be just short. I was not worried about a “weak” presidency, but I thought some degree of post-electoral bargaining would be necessary. Well, that was silly. I somehow forgot that our assumptions about how votes translate into seats in France are based on the “textbook” French V party system, whereby there are many parties, but two dominant blocs. In such a setting, a leading party (such as a just-elected president’s) with around 30% of the vote would be just far enough ahead of both its allies and the leading party of the opposing bloc so as to translate into a solid majority of seats for the alliance, but not necessarily for the leading party itself. The bloc of the loser of the second round, in the “textbook” party system, is not so far behind the president’s bloc. Therefore, you get a clear pro-presidential majority, but not a knock-out. Two things should have given me pause. First of all, that the second round presidential candidate was of the National Front, so 2002 would be a better guide than, say, 2012. In 2002, the party of the second major bloc (i.e., the Socialists, whose presidential candidate had finished third) suffered terribly from the honeymoon cycle, and of course, the FN assembly candidates did poorly for lack of allies. This allowed just 33% of the first-round votes for the newly elected president’s party to translate into more than 62% of the seats. Second, and more to the point, the party system of France 2017 has collapsed badly. Thus being at only 30% of the votes makes you a dominant player in what is, for the time being, a one-bloc system. If you are the centrist party in a two-round system, it does not matter that you lack allied parties in a bloc; what matters is that you have no opposing parties that combine for a coherent bloc against you. Seat projections, issued on the day of the first round of the assembly election, suggested that LREM could get over 400 seats. Some even say 475 (out of 577). LREM candidates will win by default, because in relatively few districts will there be active coordination against them. Moreover, turnout is (predictably) low today. The following screen shot from Henry Schlechta on Twitter, shows just how dominant the LREM is in today’s runoffs. In other words, don’t let 32% of the first-round votes fool you (as it did me). With different opponents in different districts, from different political camps, there is no reason not to expect a massive majority. Now that everyone seems to accept that LREM will have a big majority, the concerns (expressed in various news media stories) has shifted to how difficult it may be to govern with a party full of novices. Such concerns are also misplaced. That the party is full of novice politicians makes it more, not less, likely that it will stick to Macron even when times get tough. They have nowhere else to go. They owe their nominations and assembly seats to Macron. France 2017 is presidentialization on steroids!. And, remember, honeymoon elections matter. Things were progressing more or less as expected as Macron assembled his pro-presidential party and appointed his choice of premier and cabinet, effectively saying to voters, here is the government I want you to approve. An assembly majority for La Republique En Marche to support the government, following runoffs in a week in most districts, is easily within reach. That is at once remarkable–the party nominated its candidates within the last month solely to support a presidency that looked unlikely as recently as several months ago–and utterly predictable–to those of us who do logical models of electoral system and presidential effects. On 23 April, when many commentators were lamenting how weak (then-expected) President Emmannuel Macron’s support might be in the National Assembly, I offered an estimate of 29% of the vote for his newly formed party. I based this solely on the mean surge that presidents’ parties tend to have when an assembly election occurs early in their terms–a honeymoon election. Maybe that was an underestimate. While one poll (OpinionWay/ORPI) has Macron’s party, La République en marche! (LRM), on 27%, Harris Interactive sees it on 32%. Both agree this will be the biggest party (Reuters). Given the electoral system, such a share puts Macron well within reach of having a majority in the Assembly. And what a party it is! Half of the LRM preliminary list of 428 candidates for the 577-member National Assembly are women and 52 percent are civil society figures. A leading French conservative accused President Emmanuel Macron of “dynamiting” the political landscape on Tuesday as he put together a government that is expected to include former rivals on both left and right. In other words, he is being “accused” of doing precisely what he won nearly two thirds of the vote (in the runoff) saying he would do. over 20 LR members of parliament, including some party heavyweights and former ministers, issued a joint statement on Monday urging the party to positively respond to the “hand extended by the president”. All of the above should serve as a reminder of two things: (1) the purpose of the upcoming election is to ratify the new executive’s direction, not to be a second chance for an alternative vision; (2) the honeymoon electoral cycle matters. France: what to expect for the assembly? I am going to assume the polls are right and Emmanuel Macron will squeak past Marine Le Pen and be elected president in the runoff in France’s presidential election. (The polls actually suggest he will win at least 60% of the vote.) Let’s think ahead to the assembly elections, which come in June (also in two rounds). I have seen various references to a likelihood of “cohabitation”. This is nonsense, if we define that term properly to mean cases in which the president and premier are from opposing parties and the president’s party is not in the cabinet. But let’s give people saying this the benefit of the doubt, and assume they mean the presumptive President Macron will have a difficult coalition-building task ahead of him with the assembly he will face. This is not unreasonable to assume, given that Macron has no existing party to start with. Even this weaker prediction of a challenging assembly environment for the young “outsider” president is probably wrong. 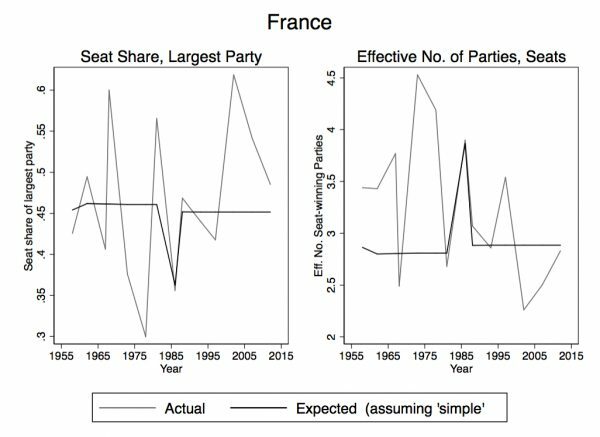 Honeymoon elections really matter, and France has had, since 2002, an extreme version of a honeymoon cycle, with the assembly election only about a month after the presidential. This first graph is from the forthcoming Votes from Seats by Matthew Shugart (yes, me) and Rein Taagepera. Unlike most graphs in this book, this is not a logical model. That is, it is not based on deductive logic for the specific equation plotted. The equation is an empirical regression result. However, the basic idea of a honeymoon surge is itself well documented (as explained in Chapter 12 of the book, citing earlier work by me and others). The plot is of the “presidential vote ratio” against “elapsed time”. The presidential vote ratio, or Rp, is the vote share of the president’s party in the assembly election, divided by the president’s own vote share (in the first round, if two-round system). Elapsed time is the number of months into the presidential inter-electoral period in which the assembly election took place, so 0 means a concurrent election (same day) and the more closely elapsed time approaches 1.0, the closer it is to the next presidential election (but before it). In other words, if the pattern holds for France, 2017, we should expect Macron’s new party, En Marche!, to get around 29% of the vote (24*1.19=28.6). Is that even possible, given En Marche! did not even exist prior to Macron’s campaign? I do not know, and I will not call this a “prediction” given it is just an empirical pattern and not a logical model. But there you have it, for what it is worth–in the absence of any other information, I am going with around 29% of the vote. 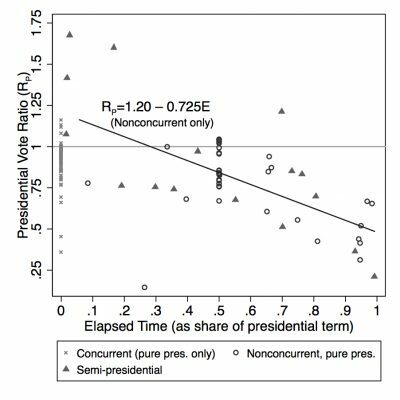 Note that there is only one non-concurrent election with E<0.1 for which Rp<1. Even with an untested party, I like Macron's party's chances of getting over 25% of the vote. For comparison purposes, note that a largest vote-earning party in this range would not be unprecedentedly low for France. In 2012, the Socialist Party of just-elected Francois Hollande won 29.4%, and this was the largest percentage for any party in the election by a margin of 2.3 percentage points. Hollande himself had won 28.6%, so his party had only a small honeymoon boost. In 2007, Nicolas Sarkozy’s UMP did better, at 39.5%. Sarkozy himself had won 31.2%, yielding a boost about in line with that implied by the Rp equation. Of course, what matters more is seats. Does the French electoral system tend to boost seat shares? Yes, we might say that it does. Despite the low shares for the largest party, the use of two-round majority-plurality in single-seat districts means that the largest party can expect quite a further boost indeed. It might be noted that the previous honeymoon elections depicted here are 1981, 1988, 2002, 2007, and 2012. All show s1 above and NS below the expectation. In other words a less fragmented party system due to the honeymoon boost for the just-elected (or, in 1988, reelected) president. Even in 2012, with his party on only 29.4% of the votes, Hollande almost had a co-partisan majority. His Socialists had 48.5% of the seats, thanks to the electoral system; with allies, he had a large working majority of over 57%. Of course, the reason why we might expect s1 to be higher than predicted and NS to be lower is the the largest party benefits from alliance deals in the districts between rounds. But the expectation on seats–based, again, on the incorrect assumption that this is a plurality system–is not too far off, despite the fact that the votes are so fragmented that a party with just 30% in the first round is sometimes the biggest party. We can assume that Macron and En Marche! will benefit from alliances against the National Front. It is harder to predict what the patterns will be with respect to the traditional right and left. The bottom line is that I would expect En Marche! to emerge as the biggest party, based on the honeymoon cycle, with somewhere between 24% and 30% (maybe more!) of the vote, and somewhere between 40% and over 50% of the seats. I would further expect Macron to have no difficulty appointing a premier of his choice, and to have a ruling coalition that will be dependent on him for its very existence. Of course, I can’t say how effective this coalition will be at governing, or whether it will last Macron’s term, or even if my expectations will be proven totally wrong. But at the very least, let’s not wring our hands over prospects of a president hobbled from the start. The electoral cycle (honeymoon elections) and the electoral system (majority-plurality) work very much in the incoming president’s favor, and these patterns may well hold even for a president from a new and untested party.